Very rarely will I visit a restaurant twice in one week. In order for me to do so, the food has to be amazing. Recently, I attended a media dinner for Street's Fine Chicken. I was in awe over the dishes that I tried. I returned home with a to-go container filled with leftovers for my husband. He was also in awe and recommended that we visit the restaurant over the weekend. By the time Saturday rolled around we were both eager to visit Street's. Street's is the type of place that does home cooking justice. The ambiance is casual with a southern flare. I love restaurants that have an organic charm and character. Don't forget to check out the chicken murals on the side of the building. They're pretty dope and make for some great photo opps. Since I visited Street's twice, I'm going to include pictures from the media dinner and of my second visit. During the media dinner I tried a variety of Street's appetizers. Two of my favorites were the Pimento Cheese Fritters and the Little Devils aka Deviled Eggs. 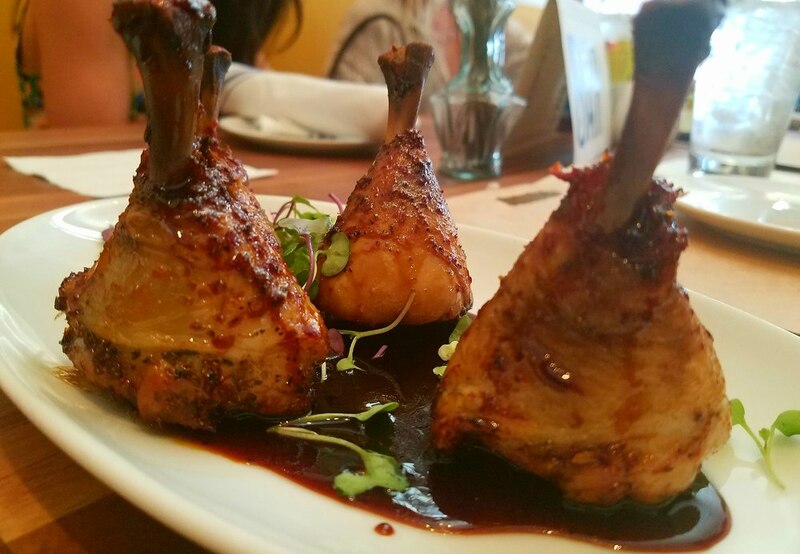 The Chicken Lollipops were also super tender and juicy. Ok, so let's get into the meat of this review. I know you are probably dying to know how the chicken was. I consider myself to be a fried chicken Connoisseur. I can examine a piece of fried chicken and determine if it's going to be good or not. Fried chicken should be crispy, juicy, and served piping hot. Street's Fried Chicken excelled in all of these areas. When I bit into my first bite I was amazed. I have to say that the fried chicken from Street's is definitely some of the best I've tasted in the DFW. I could tell that it was marinated and probably fried with a little love a.k.a. buttermilk. If Fried Chicken isn't your thing then Street's got your back. They also serve roasted and grilled chicken. Both were quite tasty. If chicken isn't your thing, they also have a mean chicken fried steak that was the bomb. The macaroni and cheese was a game changer. It was gooey, cheesy, and delicious. I seriously could've ate a whole bowl of it by myself. My husband thought that it was average but I thought otherwise. It was also one of the more popular items during the media dinner. The collard greens were also very good were topped with bits of carrots. If you're a lover of biscuits then you will probably like the biscuits at Street's. They were sweet, buttery, and served piping hot. Just order it. The bread pudding is just too good to even describe. I have no idea what the recipe is but they must sprinkle a little comfort on it before topping it with whipped cream. The bread pudding was insanely warm, sweet, and melt in your mouth delicious. Don't go to Street's without ordering it.